Yesterday was St. Patrick's Day. I day I wholeheartedly embrace! Although I'm not even a tad Irish. The traditional food are things I love and it's nice to be celebrating something before Spring -- especially if we've had a bad winter! For the past several years I've asked my Irish friends to join me for lunch. If I'm not Irish, at least I can surround myself with the Irish! Rather than an "everything" green menu, I chose to fix foods that might be found in a traditional farmhouse in Ireland. And that goes for the table too -- a classic table that an Irish hostess may use. 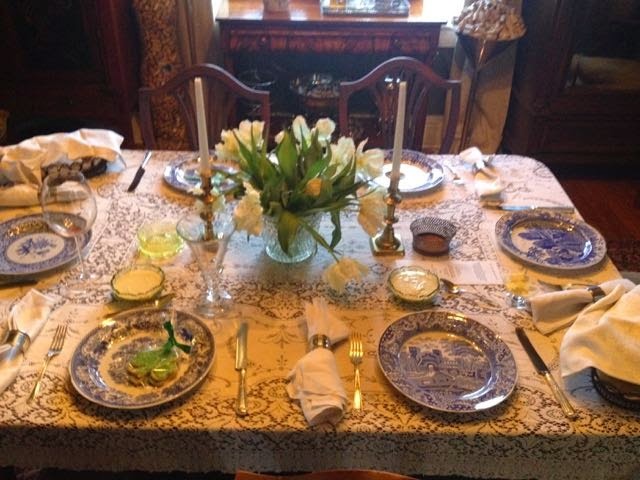 This year, however, the table had to do double duty -- because I had guests for lunch and dinner! 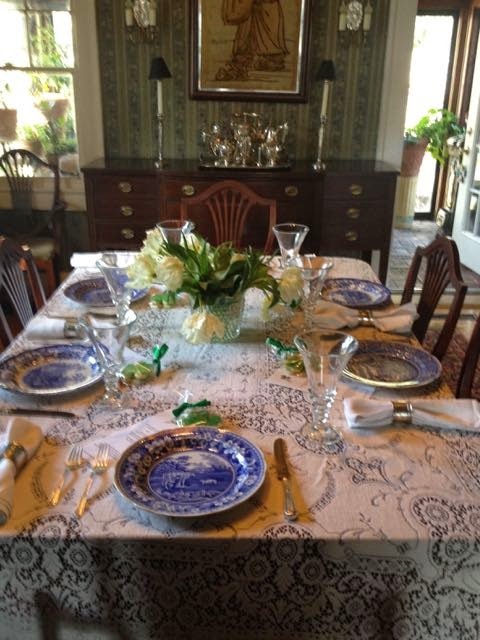 The luncheon table -- lace tablecloth, blue and white transferrer, Jim's grandmother's cutlery, white damask napkins. 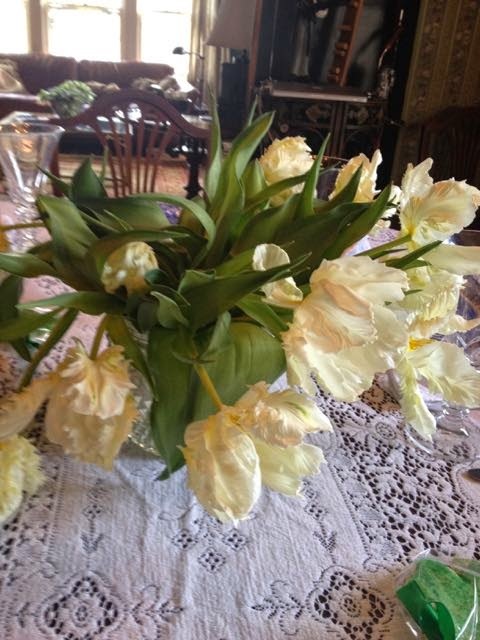 A big bouquet of frilly white tulips as the centerpiece. White because they were just so pretty! In a simple crystal ice bucket. The Spode transferrer, a menu and a bag of Shamrock cutouts as a favor. The salad was set before the guests. A kale, apricot and almond salad with an Amber Ale vinaigrette. The kale held up well to the bold vinaigrette. 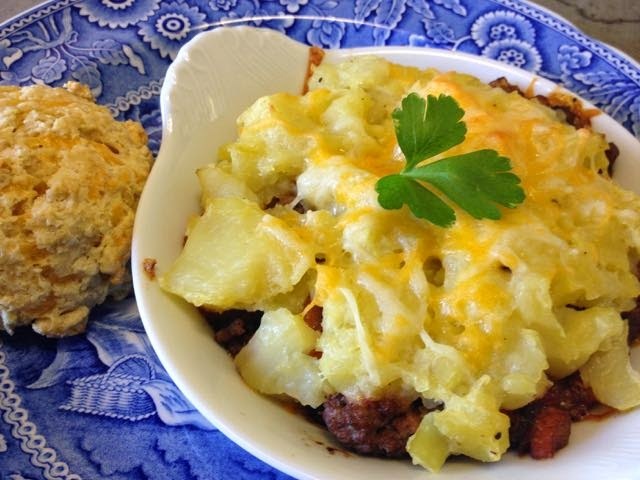 A shepherd's pie with minced lamb and a cheddar and ale scone. Parsley is replacing a shamrock on top of the pie. 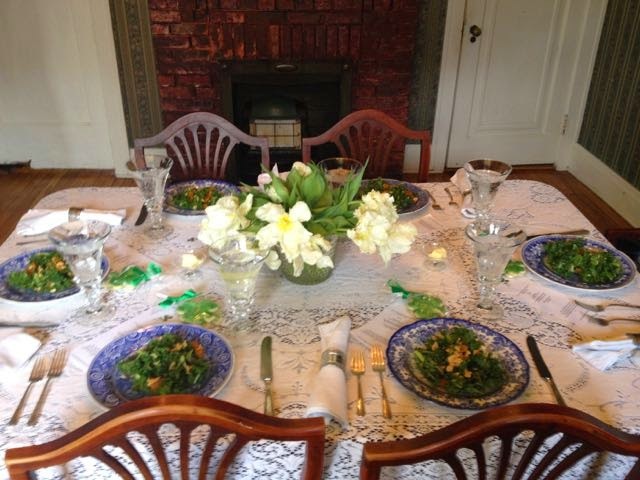 And the dinner table -- same cloth, same flowers, candles added (because it is evening) and shamrock cutouts at only the lady's places! Irish soda bread and horseradish sauce on the table. Same cutlery. Same napkins. 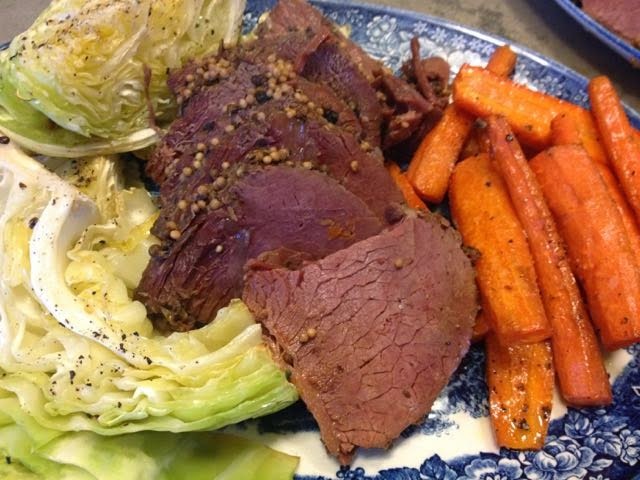 Dinner is corned beef and cabbage. Served family style. Two big platters so that each end of the table had their own platter. It's easier that way when you serve family style to make two smaller platters rather than one huge one! An Irish whisky cake was dessert both at lunch and dinner. For luncheon, I baked them in individual bundts. For dinner, it was baked in the small bundt. It's a good cake. I will make it again and it's an easy cake. Made the day before so that the Irish whisky flavor could develop. 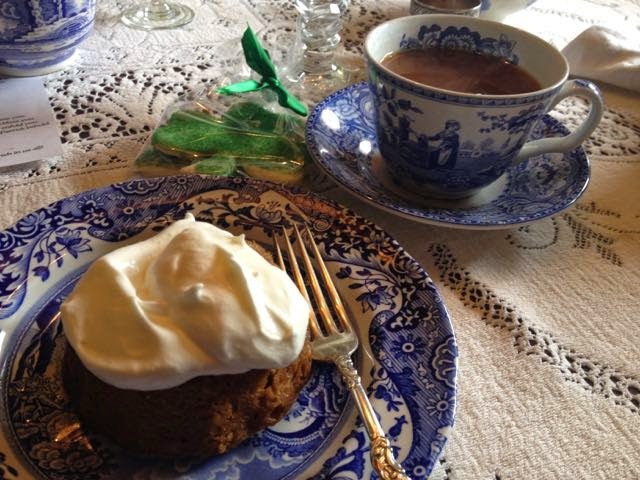 Served with a big dollop of whipped cream. And after dinner an after dessert . . .
We had an Irish coffee. 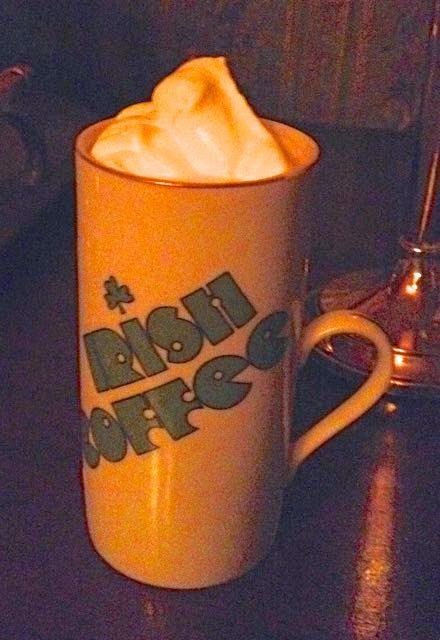 A jigger of Jameson in the bottom of the cup, a sugar cube muddled into the whisky and then hot coffee poured in and topped with whipped cream! It's Thursday and I'm sharing my One Table -- Two Parties with Susan at Between Naps On the Porch for Tablescape Thursday. Fabulous, Martha! You set the standard! Happy St. Patrick's Day! What a great idea to do an Irish farmhouse-inspired menu! Your table is perfect for BOTH occasions, but honestly-- you had me at the white tulips! I'm another one of those who doesn't have a drop of Irish blood running through her veins, but loves to celebrate the day! 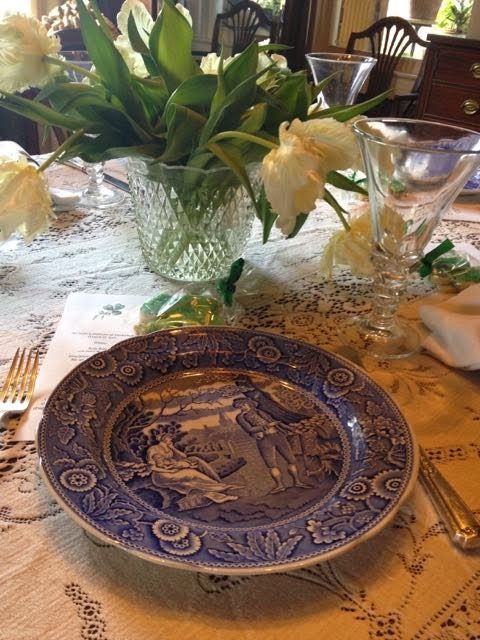 I really like the simple, elegant touches of green you added to your table, and your blue dishes work perfectly!